This upscale tasting, now in its fifth year, features the best chefs in New Orleans and Nashville creating unique bites purposely paired with Belgian and Belgian inspired beers. Why beer? Because beer pairs well with just about everything. A taste of two cities! As we’ve said, beer goes well with everything. So, to round off the evenings’ fare, patrons will enjoy chocolate, cheese and oyster bars to balance the palate. New for 2019 guests can enjoy hot and cold coffee from Intelligentsia Coffee, or wrap up the evening with The Underberg Nitecap. All in one room. Patrons receive custom glassware along with a guide to the selections. Once inside, guests are welcome to walk the room and enjoy unlimited bites and pours. To many Americans, beer is a low-brow beverage undeserving of a place in fine dining. Our Belgian friends would disagree and have centuries of culinary tradition that includes beer. There is no food that cannot be paired with beer, if you know what beer to choose. 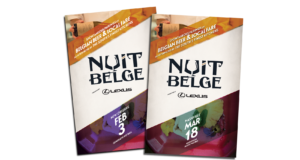 Nuit Belge is a showcase of exemplary pairings. Beer has unlimited flavors and textures with which to work. Brewers have long had food in mind as they work their craft. And what the French do with wine, the Belgians do with beer. Rhizome Productions is an event production company, based in Nashville. We conceive and produce craft beer, spirits, & food events with a focus on education and a passion for community. Leveraging our ties to the culinary, brewing, and hospitality industries, we create events that bring aficionados closer to the masters of their craft. We operate 15-18 events per year in cities across the Southeast, including Nashville, Chattanooga, Atlanta, New Orleans, and Charleston. All Rhizome events are mutually beneficial, and since 2011 we have raised over a half a million dollars for local charities.